Poet Abi Pollokoff: “island sided” contains many situation-based elements of landscape—place was one of the primary inspirations for the poem—so I was guessing that some aspects of the natural world would be present: water, island, boat, stars, etc. Artist Ira Joel Haber: I liked all the mentions of nature, since most of my art is about nature this poem appealed to me. The rocks, and islands and water, I’ve done sculptures and drawings using these images for over 45 years, but I don’t see nature in a benign or bucolic way. Nature frightens as I’ve said in statements on my art. The idea of being in a rowboat in the middle of water scares me to death, especially since I can’t swim and I’m a Pisces. Poet Abi Pollokoff: Ira’s use of border (the fixed and the shifting) captured the hesitation in the poem’s breath and motion. At the same time, it also made me reconsider the poem’s sight and the place itself, which became much more uncertain. Ira really enhanced the danger as well as the solitude for me. Artist Ira Joel Haber: This piece was just one of many that I submitted. It began as a collage very simple basically two shapes the mountain like form which was from an old drawing that I did, and the rowboat that I got from the internet and pasted it on the paper with the mountain. 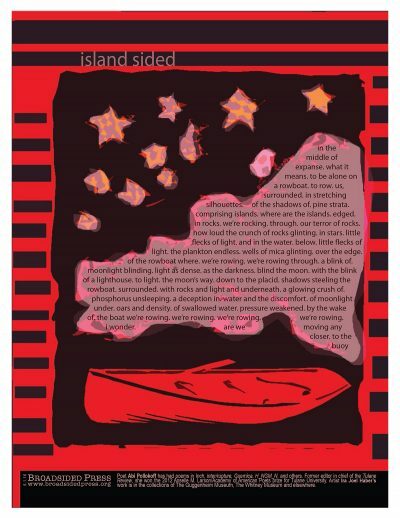 I then added stick on stars and put it through photoshop playing with colors and textures and borders until I came up with the image that was finally chosen to go along with the poem. The borders make the image look like a frame of film which I think is kinda nice, as film especially in home movies recall memories which this poem seems to bring up. Black and red are favorite color combinations for me going back to my childhood when I was a precocious kid. Poet Abi Pollokoff: At first glance, the use of red was a surprise, as that wasn’t a part of the tangible world of the poem as I experienced it. The more I looked, the more I saw shifts and movement within the red, which was really exciting—it’s changed how I remember the poem and its inspiration. Thank you, Ira! Artist Ira Joel Haber: The boldness of it, and how the broadside designer used the poem in an imaginative fashion. Poet Abi Pollokoff: I love writing with art as inspiration! Being around works derived from others’ passions and inspirations allows me to draw from that energy, and I often find images or pieces of language I don’t think I would stumble across otherwise. For me, a great afternoon activity is to go sit and write in an art museum or gallery—it’s peaceful and challenging and places my body among the art, which I believe is also an important thing. Artist Ira Joel Haber: Literature comes to play when my art and photography is used for poems, and stories in poetry and literary magazines online and in print. I’ve been very pleased that my art has been embraced by so many magazines that is approaching nearly 300 or more appearances over a short time span including Broadsided. Poet Abi Pollokoff: Perhaps: Vivaldi’s Concerto in G for Two Mandolins (Andante). Artist Ira Joel Haber: Something classical, soft but dramatic. Poet Abi Pollokoff: I’m just finishing up Karen Volkman’s Whereso. It’s so thought- and ear-provoking! Artist Ira Joel Haber: Reading some mysteries by Lawrence Block and Stuart Kaminsky. Also What I Loved by Siri Hustvedt which is a New York City novel. I like those and she’s married to one of my favorite New York writers Paul Auster. Also Follies Of God by James Grissom which is a memoir about Tennessee Williams and the actresses who were important in his life and career. Poet Abi Pollokoff: I went to a poetry and poetry comic gallery show opening (featuring Official Broadsided Twitter Voice Gabrielle Bates!) at Mount Analogue Press that explored some fascinating, complicating play between visual art and poetry. Artist Ira Joel Haber: Well since I live in New York City which is arguably the art capital of the world I see lots of art, in the galleries and the museums. This is a weekly occurrence for me. Abi Pollokoff received her MFA from the University of Washington. Her work is forthcoming or has appeared in Inch, inter/rupture, Guernica, H_NGM_N, and others. A former editor in chief of the Tulane Review, she won the 2012 Anselle M. Larson/Academy of American Poets prize for Tulane University. She lives and writes in Seattle. Poet Abi Pollokoff tempts a notable general to consider the quieter pleasures of dallying. Artist Ira Joel Haber vectorizes with some of his senior art students in New York.